Offered here is an extraordinary and important map of the Hawaiian Islands (Sandwich Islands) printed by G. Nicol and T. Cadell for the 1785 edition of Captain James Cook and James King's, A Voyage to the Pacific Ocean…in the Years 1776, 1777, 1778, 1779, and 1780. Some claim this map was drawn by William Bligh, of Mutiny on the Bounty fame, while he was stationed as midshipman on Cook's fateful third voyage to the South Pacific. Others claim that this map was drawn by Henry Roberts – the Hydrographer of Cook's third expedition. The text of the Third Voyage credits Roberts, however, the British Hydrographical Office copy of the Official Account includes Bligh's journal where he claims to have drawn the maps. In the lower left there is a large inset of Karakakooa Bay and the villages there. It was here that Cook was killed by angry Hawaiians. This map represents a seminal moment in Hawaii cartography and is the basis upon which all subsequent maps of Hawaii were drawn. Very good condition. Narrow margins. Some old repairs/reinforcement. Minor transference. Blank on verso. David, A., The Charts and Coastal Views of Captain Cook's Voyages, 3.81A. 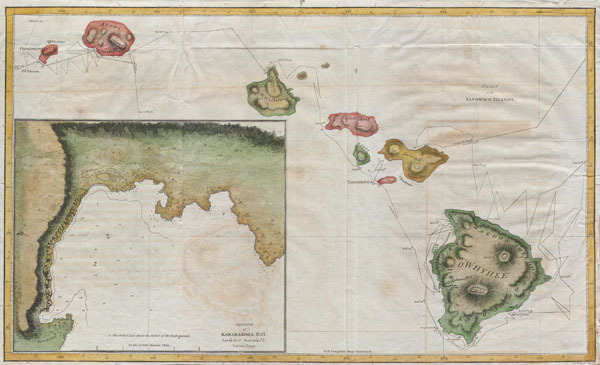 Fitzpatrick, G.L., The Early Mapping of Hawai'i, pl. 2.